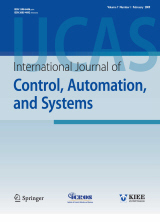 Abstract : "This paper represents a novel less conservative stability criterion for time-delay systems with nonlinear disturbances. The main purpose is to obtain larger upper bound of the time-varying delay. A suitable Lyapunov-Krasovskii functional (LKF) with triple integral terms is constructed. Then, two new generalized double integral (GDI) inequalities are proposed which encompass Wirtinger-based double inequality as a special case. A simple case of the proposed GDI inequality is utilized to estimate double integral terms in the time derivative of the constructed LKF. Further, an improved delay-dependent stability criterion is derived in the form of linear matrix inequalities (LMIs). Finally, some numerical examples are given to illustrate the improvement of the proposed criteria." Keyword : "Generalized integral inequalities, Lyapunov-Krasovskii functional (LKF) method, nonlinear disturbances, stability analysis, time-delay systems. "